Signup ...it's safe, easy and free! Dr. Jos� Arg�elles, creator of the new calendar, gained notoriety for his role in the Harmonic Convergence event, following the release of his mystical book about the Maya calendar, The Mayan Factor: Path Beyond Technology. He produced "Dreamspell: The Journey of Timeship Earth 2012" and a game/tool "Telektonon: The Talking Stone of Prophesy". The Dreamspell Calendar was born. The calendar begins on July 26 with the helical rising of the star Sirius and runs for 13 28-day months for 364 days. July 25th, is spent in celebration of the "Day out of Time", and makes up the 365th day. This is the conversion of Gregorian dates to the kin on the Dreamspell Tzolk 'in. Space Station Plaza is growing in popularity! As we become a popular destination for galactic citizens, more and more tools are being added to help you learn about and use the Dreamspell Calendar. Check it out before you join. Check it out before you join. Sign Up to be a Passenger! Join Space Station Plaza... it's free and very informative. Programmers are working hard right now to give you the tools you need to connect with other kin as as SSP becomes a popular destination of galactic travellers. 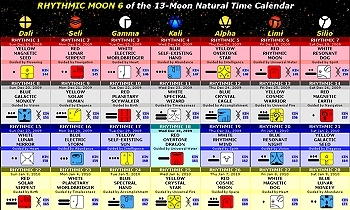 The name given to the growing movement of people using the 13-Moon Natural Time Calendar to harmonize with natural cycles through the . Your kin is a number between 1 and 260. The number you get is based on your birthday automatically decoded for you on SpaceStationPlaza.com. Your kin translates to your galactic signature, the combination of the 13 tones and 20 tribes. All kin are somehow related. This shows unique relationships to other passengers and famous kin. Once you decode your birthday, you'll see your relation to kin in four different tribes. Passenger can connect with the kin in their destiny pattern. to harmonize with natural cycles. of the 13 tones and 20 tribes. relation to kin in four different tribes. with the kin in their destiny pattern. on the Dreamspell Tzolk 'in. Space Station Plaza is growing in popularity! to help you learn and use the Dreamspell Calendar. Check it out before you join. your kin, and you can help "The Plaza"